What makes Georgian wine unique is kvevri – large clay vessels used for the fermentation and storage of wine since ancient times. Even though kvevris are buried below ground level, old masters still decorated the surface with their signature patterns. It is a sign of special reverence. In recent times, the monastery has embraced modern technologies, but it keeps making some of its renowned wine the old way. Father Gerasime showed us how: “Traditionally, grapes are pressed by feet in this vessel made of a whole tree trunk. This one is very old but it’s still in usable condition. In the wine cellar hall where we make the traditional Kakheti kvevri wine. Each village in Kakheti’s fertile valleys makes its unique wine. This living heritage is perpetuated in songs and poems, arts and crafts. The walled town of Sighnaghi, restored to its 18th century beauty, is known as a ‘City of Love’ and a city of craftsmen. For Davit, a local woodcarver, grape vines are a symbolic thread that ties all the generations together. 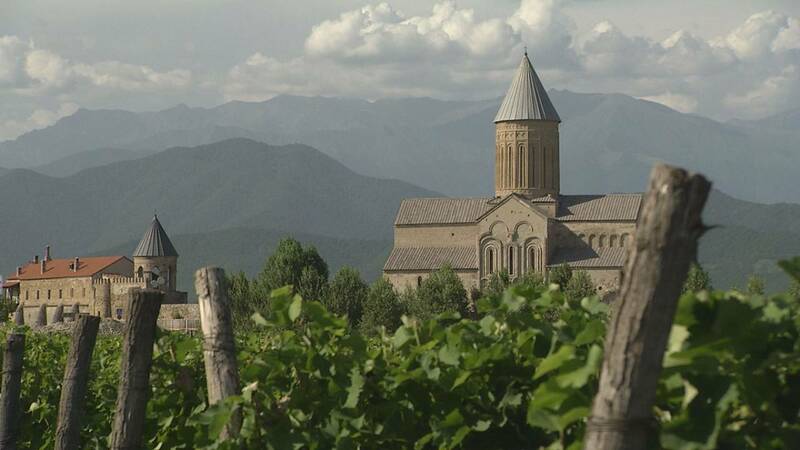 “In Georgian culture, the vineyard is the most important thing. For a peasant, his grapevine comes first, and then only next comes the family, that’s what our ancestors said,” he explained. This special attitude survived many ordeals in Georgia’s history, with waves of invaders trying to uproot the cherished tradition of growing vines. It has survived and remains as strong as ever. A family vineyard is not just wine. By dipping a thread of walnuts in thickened grape juice, the locals make churchkhela – the delicious all-natural candy invented in Kakheti. “Churchkhelas are good for your health, and they are more nutritious than bread. At the harvest season, each family makes 500 to 600 churchkhelas,” said Kristine Zaalishvili. After couple of weeks of sun-drying, the sweets are ready. Dry grape vines make the best charcoal for shashlik, the main dish at any gathering and a symbol of Georgian hospitality – just like the wine from the kvevri family. And when the wine is ready, each proud Kakhetian will assure you, it is the best in the world. “Wine is a gift that God gives us through the work of men to make our hearts happy, our bodies strong, and our souls pure,” concluded Father Gerasime.